The game that took the RGCD cartridge competition by storm is now also available from Psytronik Software! 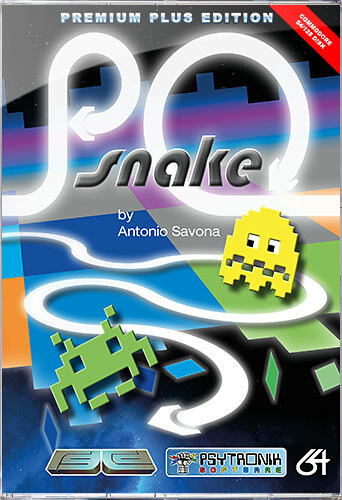 P0 Snake features 30 levels that you must negotiate using a very novel one-button control system. The Premium Plus disk version of P0 SNAKE is presented in a clear plastic case featuring professionally printed full colour artwork. The floppy disk is presented in a glossy disk sleeve with full colour label. Your snake naturally rotates clockwise, holding the fire button rotates it anti-clockwise. Depressing fire for just the right amount of time will allow you to move your snake around the screen - sounds tricky but you will soon master it! The length of your snake increases during play - so be careful not to eat your own tail! Collect an allotted number of dots to complete each level and watch out for obstacles and enemies along the way! • 30 levels to negotiate!